Introduction: We have waited... and now they're finally out. The Performance Tuned (PT) baitcast Quantum Energy reel utilizes innovative new materials combined with many hours of tweaking to gain the most out of each high performance packed part. We at TackleTour dug into the guts of the Energy PT to see what this reel is all about. Impressions: When I received the new Quantum Energy PT and took it out of the box, my first impression was that it certainly looked like a high performance reel. The Energy PT has a beautiful chassis that's very attractive, and is a combination of aluminum and matte ceramics. This is because Quantum uses a special vacuum deposition process to apply a thin layer of atomically "metallized" alloy on the reel. The E600PT frame is die-cast from a single piece of high quality grade aircraft aluminum and alone it weighs only 1.27 ounces. Also the frame that holds the other components together are CNC machined to precisely fit all the components. The Energy PT makes use of good materials. The reel uses a nice matte aluminum on the star drag which actually increases your grip on the drag for quick drag changes...your finger won't slip on this one! What is Hot Sauce? 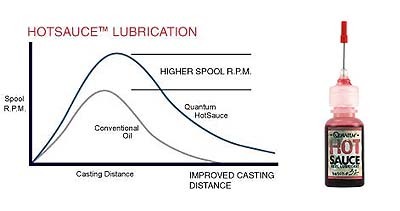 : Hot Sauce is Quantum's unique lubricant made from a secret formula that's available only in Quantum's reels. This special low viscosity oil achieves freer rotation in bearings, gears, and the spool. Lab Tests: We tested the Energy PT's free spool, drag, and cranking performance in our lab. Quantum's free spool was quite good. This is due to their Super Free Spool pinion design combined with the Hot Sauce and other factors to allow the spool to freely rotate. Next we tested the overall cranking abilities. The Energy PT comes with 5 Ball Bearings and 1 Roller Bearing that's made from a polymer-stainless hybrid. Not to get too technical but when you mix two strong bonding materials together to form one, you're improving and strengthening the final product... the bearings in our case. The bearings gave the Energy PT a smooth ride through our cranking tests. Quantum's Continuous Anti-Reverse did it jobs, but there is a tiny amount of back play. Most people won't be able to detect this and in most cases will not degrade the reel's performance. Real World Tests: We paired up the Quantum Energy PT with the Hookhider IM8 and went out for 7 days of intense pre-spawn bass fishing at Anderson and Calero Lake. Casting: Casting the E600PT was quite impressive. The FREE setting allowed the spool to freely spin while the fishing line flowed smoothly from the Energy PT. I was able to acquire distances that's comparable to the three hundred dollar reels. Fast, smooth, and accurate... this is because the Quantum E600PT uses it's Super Free Spool pinion design, along with the Hot Sauce, allowing superb casting ability. The Cast Control System: The Quantum Energy PT uses an improved Adjustable Centrifugal System (ACS). The ACS II cast control system, now with 9 brake weights, allows you to simply adjust the brakes externally with an easy turn of the dial. Just turn to one of the four break settings(0[Free], 2, 4, or 6 brakes) and you're ready. There's no need to hassle with ripping off the side plate every time you need to adjust to the desired setting. When casting at each of the break settings I was able to feel and experience the difference. One way to test if it really works is to cast sloppy (with minimal thumb control). In all of the settings except Free, no backlash occurred. But once you set it to free and try a careless cast you're in trouble! The four break settings provide cast control for anglers of all levels and allow everyone to jump right in and use the Quantum Energy PT without the hassle of constantly untangling backlashes. The Spool: The Energy PT fishing reel utilizes Quantum's new Maxcast skeletal aluminum spool that's lightweight and machined to be perfectly balanced. The Maxcast spool along with the other critical components assist the E600PT in casting further while reducing friction as much as possible. The Drag: The Quantum Energy Performance Tuned baitcast reel went through our drag lab test with minimal flaws. We now test the drag when fighting pre-spawning Largemouth Bass of different sizes one after another. The drag worked good during our field tests battling big fish when set to the correct tension. Quick and fine adjustments were done with little effort when needed. Remember the little flaw during the lab tests? 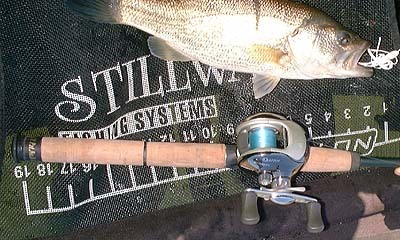 This did not affect fishing because you normally would never have the drag set to the maximum tightness. Note: Remember to loosen the drag after each fishing trip. 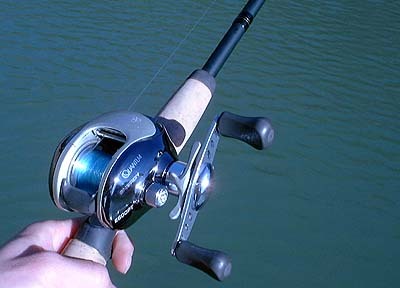 This is recommended by all reel manufacturers. After many days of fishing I did notice something about the drag. The drag started to degrade. For example, the drag setting on day one was much tighter than on day seven. With the same amount of pressure placed at the end of the fishing line. Again, this was at a much higher drag setting than most people would use. Because we test each feature we must cover the entire range of drag settings. The Retrieve: With a gear ratio of 6.2:1 the Quantum Energy PT excelled in this area. There are a few different components that contribute to this high performance. One thing is the smoothness. I really enjoyed how each crank freely flowed though. With 5 special high speed ball bearings that minimized noise and friction, plus the Hot Sauce lubricant, allowed a smooth retrieve. Next the E600PT employs performance tuned CNC machined gearings. Quantum's strong brass alloy Magnum Gears offer pure fighting power, durability, and control. This gave me confidence in muscling the large fish. Along with the high gear ratio that allows you to haul the fish into the boat quickly, the longer handle adds to this power. The longer handle allowed me to use less effort on every turn. Fish after fish the retrieve was simple and I experience little fatigue. J Solid chassis L Drag can't achieve max. Conclusion: When a group of minds get together and start brainstorming, you know the final result will be a good one. Quantum and their team of engineers (weekend warrior fishermen) put all their ideas together to compose and tweak what they now call a Performance Tuned final product. They applied this concept and created a fresh line of Quantum Performance Tuned reels. 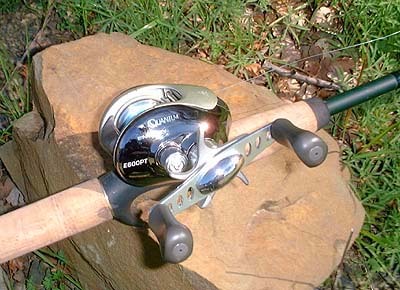 The Energy PT is one of the reels that Quantum improved upon, adding new components, reworking, and modifying.... that enhanced the overall performance of the reel. 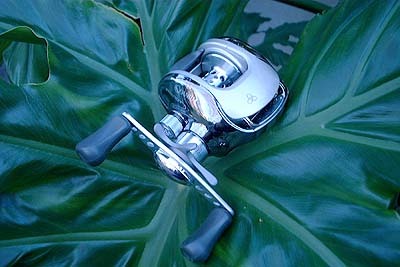 The final result... a brand new reel that excels and impresses anglers. Overall, the Quantum Energy PT (E600PT) is a good reel for it's price and you might be amazed like I was.